The DAX index has posted strong gains on Tuesday. Currently, the DAX is at 12,106, up 0.72% on the day. Earlier in the day, the index touched its highest level since October 1. In economic news, German ZEW Economic Sentiment improved to 3.1, beating the estimate of 0.9. The all-eurozone indicator followed suit, rising to 4.2, above the forecast of 1.2 points. On Tuesday, the eurozone releases CPI and OPEC members hold a meeting in Vienna. 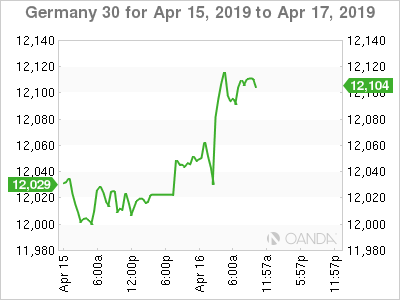 The well-respected German ZEW economic sentiment survey is a key gauge of investor confidence and can have a strong effect on market direction. This was the case on Tuesday, as a strong score has sent the DAX higher. The indicator has been mired in negative territory for the past 12 months, and finally climbed into territory in April. The score of 3.1 points to slight optimism on the part of institutional investors and analysts. The eurozone indicator showed a similar trend, climbing to 4.5 points, its first gain since May. The improvement in investor mood is attributable to the Brexit extension, which will give the parties time until October to try to reach a resolution to the deadlock. The ZEW said that investors were hopeful that the global economy would develop “less poorly” than expected. At the same time, eurozone growth remains weak and Germany is expected to cut its growth forecast for 2019, a result of a drop in exports. The economic slowdown in China has rocked equity markets worldwide, but there are signs that the world’s second largest economy is moving upwards. There was relief on the weekend, as China’s trade surplus surged to USD 32.64 billion. Last week, Chinese CPI posted a gain of 2.3%, its best gain in 5 months. A key test is on Tuesday, with the release of Chinese GDP. Third-quarter growth edged lower to 6.4%, and the estimate for Q4 stands at 6.3%. Although these are very strong growth rates, the downward trend has investors worried, and a weak GDP reading could send equities lower.